Based on lessons learned, knowledge of the industry and customer challenges, we’ve identified 11 best practices to “bulk” up your email marketing program for a successful 2011. You’re subscribers will be happy if you do. Our suggestion on how to get started is to evaluate where you are currently then map out a process with a time line to improve your email marketing strategy. If you need an extra hand, we’re always here to help. Map out each customer touch point to identify opportunities for organic list growth in a comfortable environment (store front, call center, sales representative, website, social media, viral campaigns, etc.). Compose a value statement of “why” they should subscribe and communicate that statement through each touch point. Welcome your new subscriber to thank them, set expectations and enhance their experience. Most email service providers have built- in automation to streamline this task. Read More. The tone or “voice” of all communication should reflect your corporate culture and your brand. I highly recommend the book “Delivering Happiness” to explore corporate culture, establish core values and create customer loyalty. This book is excellent and easy-to-read. I couldn’t put it down! Ask questions to get to know your subscriber to guide relevant communication. This includes frequency. 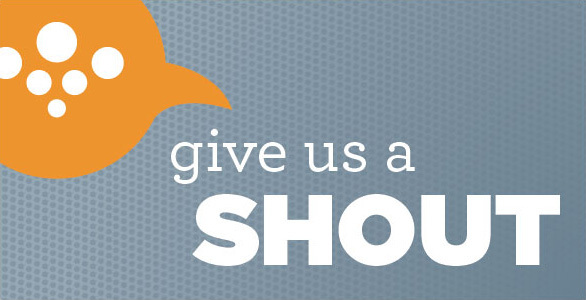 Identify how often your subscriber would like to hear from you then honor that request. Read More. Take the information obtained above and segment your audience to send relevant content. Learn more. A marketing calendar and / or schedule not only makes your job easier but will keep fellow employees and vendors on task as well. Set at least one goal for the campaign with a clear call-to-action. Prior to send, double check that you met that goal. Design goes beyond pretty pictures and performance-driven design will improve results. Learn More. Outlook, Yahoo and Gmail have made a few changes that challenge email marketers. Learn More. Incorporate social media into your email campaigns. Learn More. Test, test and retest. Send a test to different email clients to make sure your campaign is rendering properly and your message is getting across. Conduct and A/B Split Test prior to hitting send to enhance engagement. 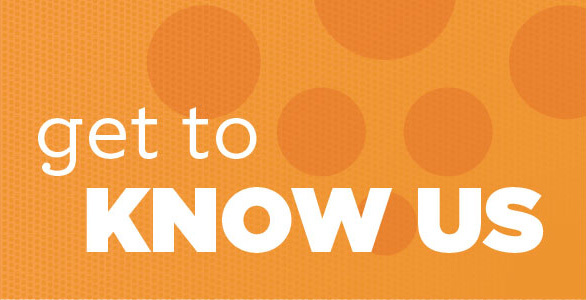 ExactTarget is launching a new feature in a few weeks to simplify this important task. Data leads to great insight that will only improve your email marketing program. Listen to your customer. If you add value to their lives, positive results will follow. Work smarter.Use automation to enhance the customer experience. Automate to send relevant life cycle campaigns such as happy birthday, happy anniversary, customer service evaluations and reminders based off of purchase behavior. Tie automation into your CRM or POS and wow! Deliver subscribers timely, relevant content that improves their lives. In fact, Inbox Orange in partnership with our customer, Bluegrass Hospitality Group, received industry recognition last month for doing so with BHG Rewards. 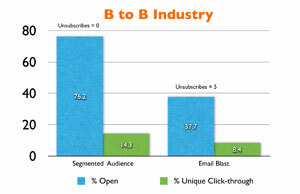 Below are two examples of tracking data pulled from recent email newsletters; one within the B-to-B industry and one within B-to-C. The email campaign that offered relevant content based on profile data, purchase history or the relationship with the sender, tracked greater open and click-through results with substantially lower unsubscribes. Becoming a one-to-one marketer takes time. 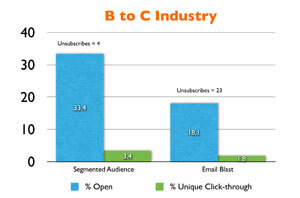 Simply asking your subscriber about their interest and frequency preference is a great start. Being creative with contests or polls is another approach. Utilizing features such as Smart Capture for Landing Pages or the survey tools incorporated within the email service provider we recommend, ExactTarget, offer a seamless approach to collecting data and storage. Both the ExactTarget Core and Advanced accounts allow for 200 attributes (data fields) – that’s a minimum of 200 ways to segment your audience! Relevancy drives loyalty. Loyalty begins with trust. Trust begins with creating an exceptional experience. Maintaining trust involves listening to your audience. Listening leads to growth and understanding. Communicating with your audience through the preferred channel with the right message drives engagement and loyalty. To explore how Inbox Orange can assist with data collection, segmentation, campaign development and analysis, please contact us at info@inboxorange.com. BHG and Inbox Orange Recognized. The Bluegrass Hospitality Group (BHG) and Inbox Orange were recognized on screen Wednesday at the 2010 ExactTarget Connections Convention as a nominee for a Subscriber’s Rule Award. Best Buy took home the award but what a great honor to be in the same space! Best Buy does an amazing job with sending relevant and targeted emails. If you are looking to follow a company that does it right, sign up to receive their email communication through Best Buy Reward Zone. Recently I purchased a new printer and within 24 hours I received a thank you email asking me if my questions were answered, directed me to the Geek Squad for assistance on set up and a link to a survey to evaluate customer service. Timely and relevant. Best Buy is a proven leader in our industry and we’re proud to be a close contender! Facebook rolled out ‘Places’ to users last week and so far, mark me down as not very impressed. I’m not sure what I expected, but Facebook Places leaves a lot to be desired. I’m not sure I get why they added it, when it doesn’t really add any value to the user experience–if anything–it adds to the noise in my news feed. I have used, some more than others, location-based services (LBS) by Yelp, Facebook, Gowalla, Whrrl, Foursquare, BrightKite, and Rally Up. SCVNGR and Loopt have found a way on to my phone, but I have not used them. With that being said, what makes a good LBS experience? I like the ability to check-in easily. (Partly because I am a freak when it comes to these LBS apps – using at least 4 of them for a while) After launching the app I don’t want to touch 5 screens to let people know where I am. I also would prefer not to “add’ a place, but as an early adopter I understand that comes with the territory. In my opinion, Whrrl has this down. I want to be able to take a picture and post a comment easily. That’s truly sharing an experience, why else would I post my ‘check-in’ to Facebook or Twitter? Maybe this is the marketer in me coming out and not the end-user. Whrrl also has this down, making it more of a way to scrapbook your experience. I want my other social friends to be using the platform. 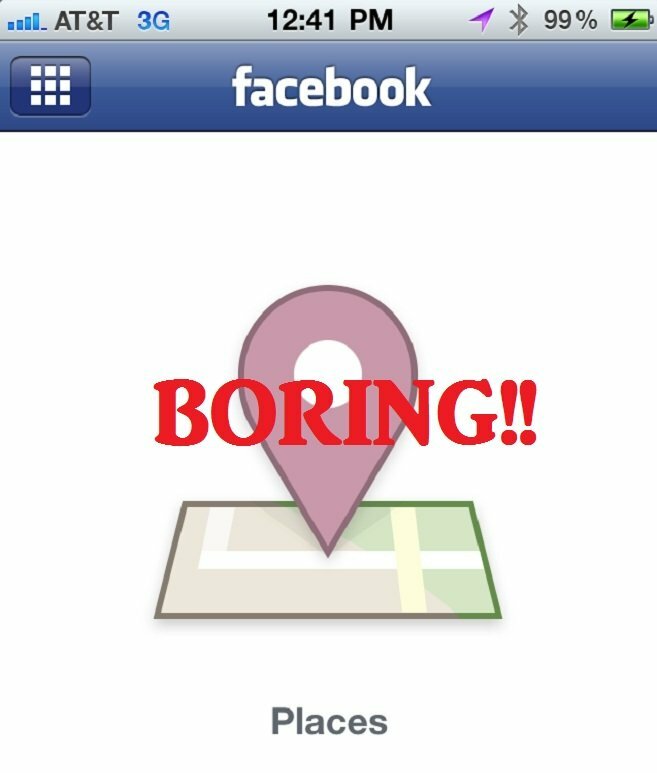 Foursquare almost has this down, but this is the only edge I give to Facebook in the LBS space. Unless they improve their other features quickly, most of the general public won’t see the point of why anyone would want to check-in anywhere. As much as I cringe to see myself typing this–I want some sort of scoring system. I kinda like how Foursquare has the points thing going. I also love the idea of badges. It makes much more sense to me than Gowalla’s items. And the mayors? That’s fun. Even my two kids get into the mayor thing. Asking me “hey daddy, are you the mayor of this place?” when the see me checking in on my phone. If you can’t tell already, I love Whrrl. If you haven’t tried it, please do. Foursquare will likely win out, since it has a lead with user adoption. But let’s hope Facebook starts going places with it’s attempt at a LBS, because if it doesn’t it may just kill the public confidence in why one can be helpful for both social consumers and social marketers.